I had been eyeing the Drop Cam Pro since it first came out. It seemed to be the darling of the online community and the reviews of the quality of the picture convinced me I should purchase one. During Black Friday, www.woot.com had one on sale for $154.99 and I impulsively bought it. The Drop Cam Pro was easy to setup and the quality of the camera did not disappoint. The night vision was excellent and the motion detection software is much better than the standard passive infrared (PIR) sensors that most other systems use. Despite all of these things, I eventually got to the point where I couldn't justify using the Drop Cam as part of my home monitoring network. The monthly cost of $10.00 a month to auto record movement clips was just too hard for me to swallow. Combine this with the fact the camera was limited to indoor use and required a wire for power and I had to look for other solutions. This left me with an expensive live camera with really great lenses. 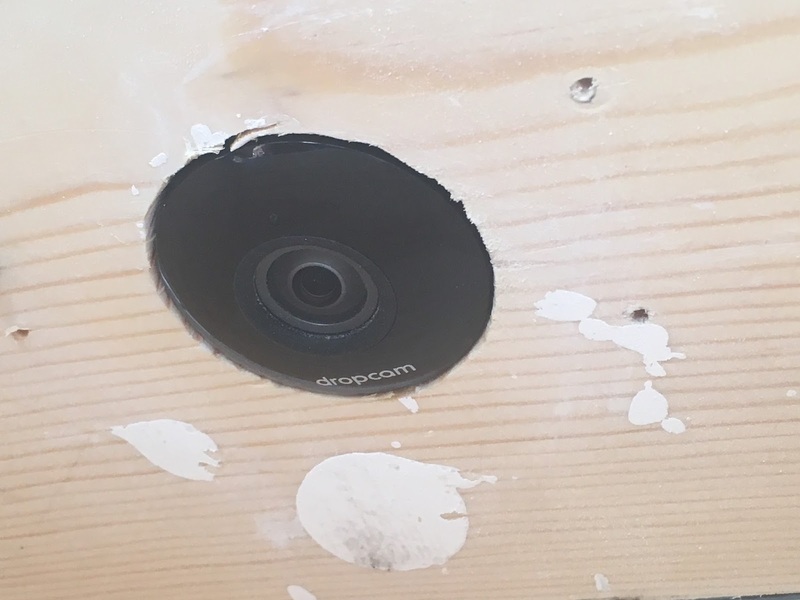 After some thought, I decided I was going to convert the Drop Cam into a nest cam. The first step was to find a suitable location for my nest cam. Each spring we have a few birds build nests on our front porch over our brick columns. 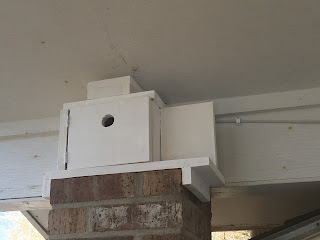 My hope was that if I built a bird house that fit on top of the columns and convinced my wife to let me keep it up there, a bird would turn it into a home. 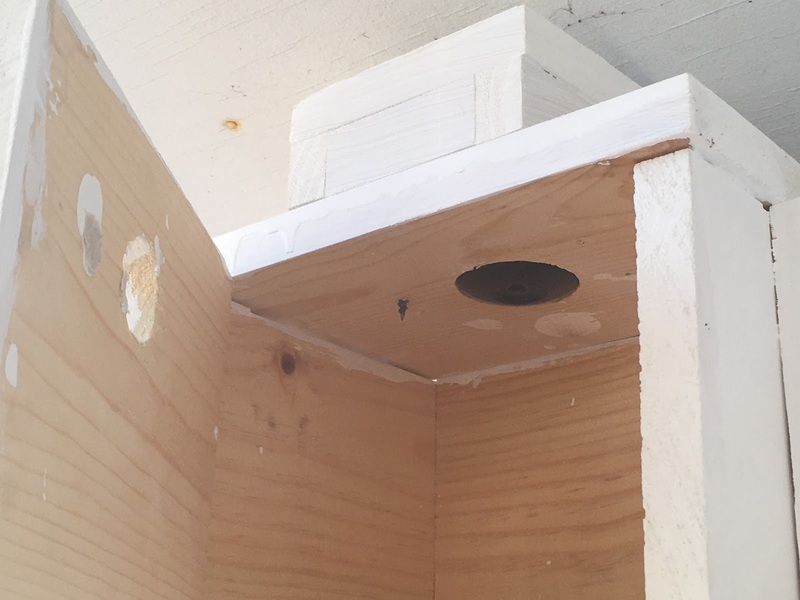 I sat down and designed a simple house with a hole in the back to mount the drop cam and peek in on the hypothetical birds. After some discussion with my daughter I realized it would be cooler if you could look down on the nest and changed the design to mount the camera on the roof. Taking the rough sketches, I begin measuring and cutting and changing my design. The first major change was that instead of mounting the camera inside the bird house, I decided to cut a hole in the top big enough for the front of the camera, but small enough to mount the camera in the ceiling without the standard mount. This gave me more height in the bird house, but required me to build a small casing to cover the exposed back of the camera. The hole was exactly 2 1/4 inches but I wish I had cut it at 2 1/2 inches. As it was, I had to shave away some of the inside to get the camera to fit. To accommodate the cord running to the camera, I cut a 1/2 inch hole which allowed me to slip the micro USB plug cleanly through it. For the bird hole, I cut a 1 1/4 inch hole which should allow smaller birds, like wrens and blue birds, to nest in it. The bird house isn't the most attractive design so I painted the entire thing white to blend in with the rest of the porch and prevent me from angering my wife too much. After letting the paint dry, we mounted the house and did some wire management. I changed my Nest account to public and now we just have to wait for a bird to take up residency. If a bird or any living creature moves in I'll blog about it. For now watch here for yourself.